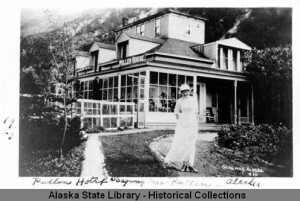 Mrs. Pullen in front of the Pullen House, Skagway, Alaska, ca. 1900. ASL-P01-4343, Alaska State Library Photograph Collection, Alaska State Library-Historical Collections. Purchasing Publications, information on how to purchase our publications by mail.